While the Golden Age of humanity may be over, remnants of their technology remain. The Suros Regime was designed utilising recovered schematics from that wondrous time. However the production was short lived due to the lack of available smart matter. Guardians fortunate enough to possess and wield one of the these weapons cherish it above all others. 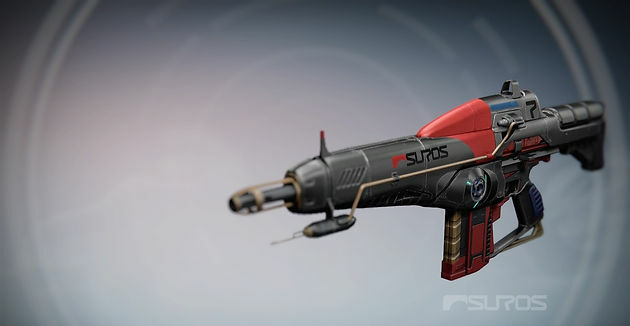 The Suros Regime belongs to the category of auto rifles that gifts it with a faster rate of fire with a lower impact. However despite this, its impact is still quite high for its fire rate. This exotic is quite powerful and its exotic perks boost its ability to deal damage with, Suros Legacy, which allows the bottom half of the magazine to deal bonus damage and a kill gives your Guardian a chance to re-obtain health. This means that half of your bullets will deal considerable bonus damage to your targets. On top of this, the Suros Regime holds the Spinning Up perk which boosts the rate of fire the longer you consecutively fire the weapon, which means that the longer the weapon is fired, the faster it will fire. This weapon has a better purpose in PVE content. In the Crucible, its exotic perk only really comes into play when the magazine is half empty meaning that for the most part, you will be waiting around for it to activate and it may only get you one or two more kills. On top of this, Suros total power may only be truly activated in a multiple Guardian firefight meaning that it just sits around as an auto rifle that does not quite deserve the exotic slot. In PVE, however the Suros Legacy perk and bonus damage can be ideal for removing some of the more powerful enemies out of commission such as those Majors and Ultras and the possibility for returned health will be able to get you out of tough spots in this arena. The Suros Regime looks quite technologically advanced with its streamlined appearance and the spinning dial above the magazine. It is helped along in this regard by its colouration, which is mostly black with a bright red that makes an appearance down the middle of the gun, vertically and on the magazine. It presents a startling contrast that while simple makes it look quite appealing. Just having to make their presence known, we have the symbol and name of the gun foundry that created the Suros Regime, Suros, on the barrel of the weapon. The Suros Regime can be gained from an exotic primary engram or purchasing it from Xur if you are lucky enough for him to have it in his inventory.